On April 12, 2006, a ten-year-old girl named Jamie Bolin went missing from her home in an apartment complex in Purcell, Oklahoma. Five days later, her naked and mutilated body was found in a plastic storage container in the apartment of her downstairs neighbor, 29-year-old Kevin Ray Underwood. After his arrest, Underwood was interviewed by two Oklahoma FBI agents. His confession is disturbing not only for its bizarre content, but for the nonchalant way in which he recounts the crime. “It started off with cannibalism-the thought of eating someone was appealing to me. 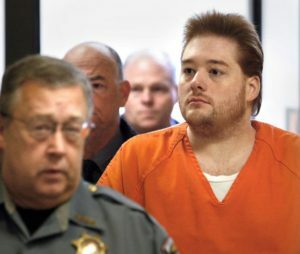 It kept evolving from there,” he admits, going on to explain in considerable detail how he attempted to carry out this plan on Jamie Bolin, whom he had decided was a convenient victim. The confession is notable for Underwood’s robotic delivery (he was later diagnosed with Asperger’s syndrome), his lack of remorse and empathy, his admission that he took a break from mutilating the corpse to chat with a girl online, and, finally, his loud fit of vomiting. On February 29, 2008, Underwood was found guilty of first degree murder and sentenced to death. He is currently on Oklahoma’s Death Row.